The Mensa organization – an international organization of “smart people like you” (i.e. if you have “scored in the top 2 percent of the general population on any one of more than 200 accepted, standardized intelligence tests” [http://www.us.mensa.org/Content/AML/NavigationMenu/AboutMensa/GeneralMensaFAQ/MensaFAQ.htm]) has local chapters around the United States, as well as an annual colloquium. The 2009 colloquium will be presenting the global warming alarmist position with speakers including AGW alarmist-godfather James Hansen [http://colloq09.us.mensa.org/Sites/colloquium2009/NavigationMenu/Program/Speakers/Speakers.htm]. It is unfortunate that a group like Mensa has chosen to focus only on alarmists rather than including any of the hundreds of scientists who disagree with the anthropological CO2-based doom scenario. In Seattle (WA), the local Mensa of Western Washington (MWW) newsletter has been running a series of articles in an attempt to stimulate people to think critically about the global warming issue. The Mensa 2009 National Colloquium (“Weather or Not – The past, present and future of climate change”, Feb 27 – Mar 1 2009) will provide global warming alarmist speakers a chance to brainwash/greenwash the Mensans. It appears the national Mensa has given up on critical thinking. Even though there are hundreds of scientists that disagree with the AGW theory that they could have included for a balanced view, Mensa has chosen a slate of some of the most extreme alarmists. The keynote speaker will be Dr. James E. Hansen, named by Time Magazine as one of the world’s 100 most influential people in 2006. Hansen makes big bucks from promoting the alarmist position – see: “More Inconvenient Truth’s about Hansen - Heinz foundation money and political endorsements” [http://canadafreepress.com/index.php/article/3671]. He also split a 2007 $1million Dan David prize with two others [http://www.nationmaster.com/encyclopedia/Dan-David-Prize]. He testified before the US Congress in 1988 warning about the impending doom. At that time he presented three scenarios for future warming predictions, as shown in the following graph (Hansen C is “drastically reduced emissions between 1990 and 2000”). The graph also shows the satellite temperature data (RSS in blue) showing that his alarmist position is one of exaggeration. 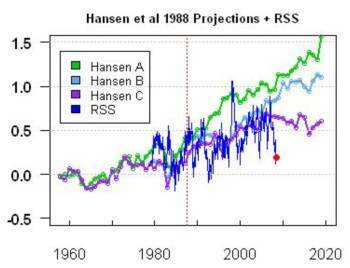 See http://www.appinsys.com/GlobalWarming/HansensPredictions1988.htm for more details on Hansen’s global warming predictions. Hansen is responsible for the GISS surface temperature analysis from station data [the results of which are available at http://data.giss.nasa.gov/gistemp/station_data/]. The analysis includes adjustments to temperature data to introduce artificial warming. As an example, the following figure shows the Tombstone historical data (left) and after adjustment (right) – notice the different y-axis scale. Overlaying the unadjusted and adjusted data from above provides the next figure showing unadjusted (blue) and after NASA adjustments (red). The older data is adjusted downward to increase the appearance of warming over time in the data. Hansen periodically revises the adjustment methods used. 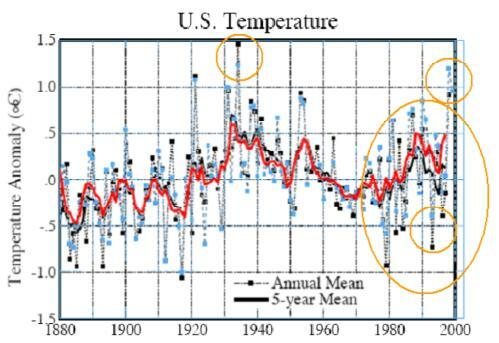 The following two figures show the U.S. temperature anomalies up to 1999. The graph on the left was produced in 1999 (Hansen et al 1999 [http://pubs.giss.nasa.gov/docs/1999/1999_Hansen_etal.pdf ]); the graph on the right was produced in 2001 (Hansen et al 2001 [http://pubs.giss.nasa.gov/docs/2001/2001_Hansen_etal.pdf]). They are from the same raw data – the only difference is that the adjustment method was changed in 2001. The next figure compares the graphs (1999 black, 2001 blue), showing how an increase in temperature trend was achieved simply by changing the method of adjusting the data. Some of the major changes are highlighted in this figure – the decreases in the 1930s and the increases in the 1980s and 1990s. So was 1934 or 1998 the warmest year in the U.S.? It depends on the adjustments. 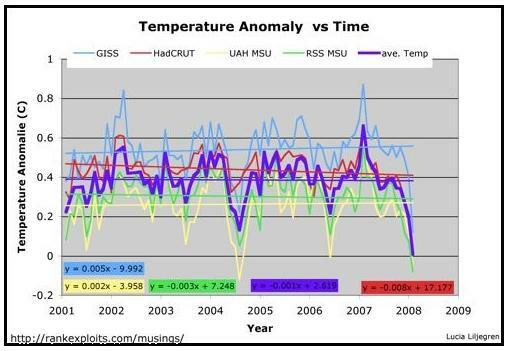 The net result is that the GISS dataset consistently shows more warming than other data sets. 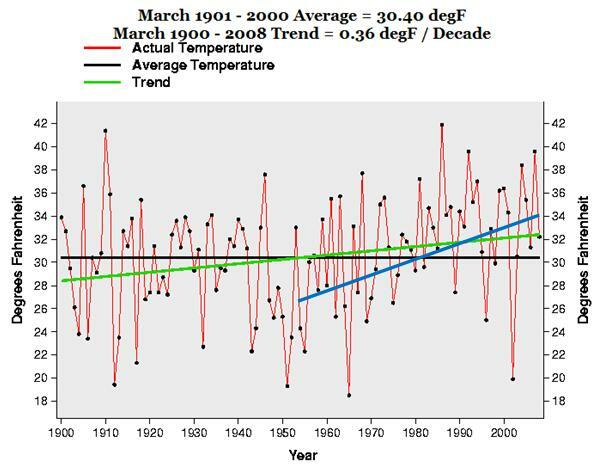 The following figure compares global average temperature anomalies for the two main surface temperature data sets (GISS – blue - and HadCRUT) and the two satellite data sets (UAH and RSS) from 2001 to early 2008. 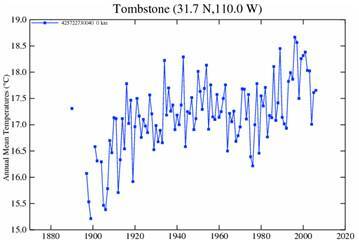 The GISS data set shows warming whereas the others do not. See http://www.appinsys.com/GlobalWarming/GW_Part2_GlobalTempMeasure.htm for more details on these issues. Climate Central is a global warming alarmist organization started in 2008 with seed money from the Flora Family Foundation and operation and development funds from the 11th Hour Project. The Flora Family Foundation also funds the Earth Institute which supports “James Hansen’s educational activities on climate change” [http://www.florafamily.org/grantees.html]. The 11th Hour Project states on its website that “coal is the enemy of the human race” [http://www.11thhourproject.org/news]. The 11th hour Project was founded by Wendy Schmidt of the Schmidt Family Foundation, which also promotes global warming alarmism [http://theschmidt.org/site/about/index.html]). Ms. Schmidt is also on the board of Climate Central. 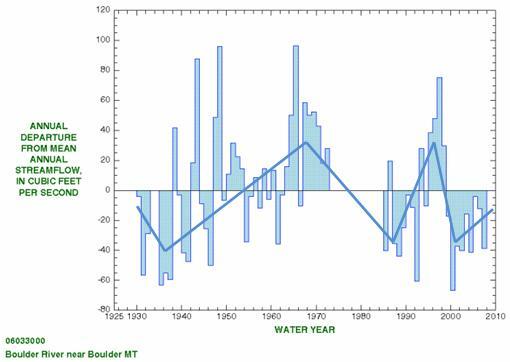 An example of their science: “An analysis by Climate Central shows that average March temperatures have risen over 7°F since the 1950s.” [http://www.climatecentral.org/video/montana-trout-drought/]. While this is a factual statement, it is selective in starting with the coldest decade in the last century. The following figure from the NOAA National Climatic Data Center [http://www.ncdc.noaa.gov/oa/climate/research/cag3/mt.html] shows the 1950 – 2008 trend line in blue and the 1900 to 2008 trend line in green for March temperatures in Montana. A 2006 paper by scientists at Montana State University and the U.S. Geological Survey (Pederson, G.T., S.T. Gray, D,B. Fagre, and L.J. Graumlich. 2006. “Long-Duration Drought Variability and Impacts on Ecosystem Services: A Case Study from Glacier National Park, Montana”. Earth Interactions, 10, Paper No. 4. ), examined drought history for Glacier National Park and the surrounding area, using tree ring proxies. The following figure is from their paper. The top of the two plots shows the observed and reconstructed mean summer soil moisture deficit over the past century, while the lower plot shows the reconstructed drought levels back to 1540. There is no correlation between drought and CO2. The Climate Central report on Montana mentions the Boulder River as a trout stream threatened by global warming. The following figure shows the stream flow in Boulder River for the historical data. [http://waterdata.usgs.gov/mt/nwis/uv/?site_no=06033000&PARAmeter_cd=00060,00065,00010] The trend from the favored starting point – 1950s – is of course reduced stream flow. The long-term trend since the 1930s is, however, increasing from the 1930s to 1950s, then decreasing and no real trend over the last couple of decades. 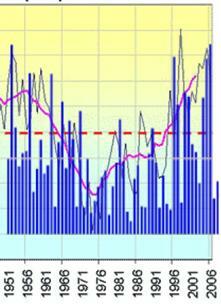 [Left]: March annual temperatures for the two closest long-term stations near the Boulder River station plotted above. The long-term view is much different than the alarmist selected starting point of 1950. [Right]: Total precipitation for January – March for the three closest long-term stations. 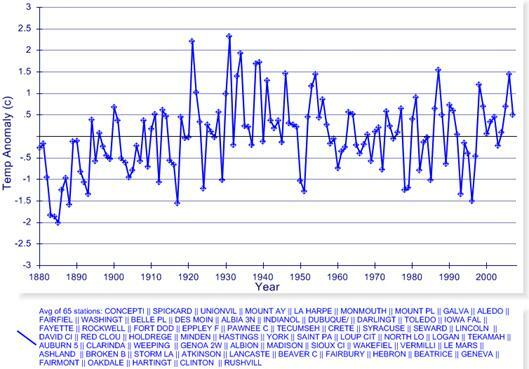 A trend towards reduced winter precipitation started in the 1800s – before CO2 became a “threat”. 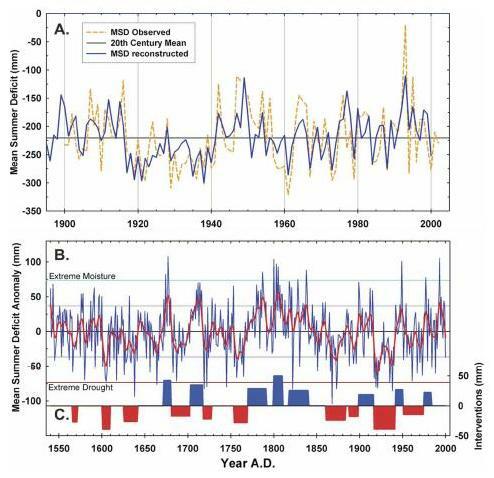 This is consistent with the fact that the Montana glaciers have been retreating since observations began in the 1800s. See the Montana – West regional study at http://www.appinsys.com/GlobalWarming/RS_Montana_usa.htm for more details. 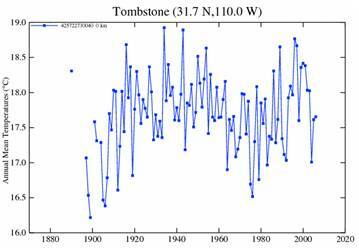 His paper mentions various extreme events of the recent past, for example, “heat-waves in the summer of 1995 claimed 1,100 lives (14), including 525 in Chicago during a single 3-week period”. 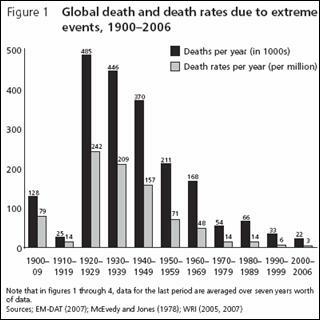 However, a study by Indur Goklany published in 2007 (“Death and Death Rates Due to Extreme Weather Events -- Global and U.S. Trends, 1900–2006” [http://www.csccc.info/reports/report_23.pdf]) shows that even during the period of 1970 – 2006 (the period in which the IPCC says has experienced anthropogenic global warming), deaths due to extreme weather continue to decline. The following figure is from that paper. Golkany’s paper shows that there are twice as many deaths per year in the U.S. due to extreme cold than to extreme heat, so Diffenbaugh’s scenario would likely be a positive improvement. Occasionally Diffenbaugh’s CO2-base alarmist statements are tempered by slips of reality: “A thousand years ago when Viking explorers arrived on the coasts of eastern Canada and New England they named the region Vinland, a designation that has perplexed many historians since grapes are uncommon there now. The weather was warmer then, however. In Medieval times there were vineyards in England that were later knocked out by a colder period known as the Little Ice Age, Diffenbaugh recalled.” [http://www.usatoday.com/weather/climate/2006-07-10-global-warming-wine_x.htm] Oops – the IPCC has tried to eliminate the Medieval Warm Period and the Little Ice Age from the record and here is Diffenbaugh letting them slip back in. “The frequency at which that scale of event occurs at high greenhouse gas concentrations is staggering. Rare events become the norm, and the extreme events of the future are unprecedented in their severity.” [http://news.mongabay.com/bioenergy/2007_06_15_archive.html]. The following figure shows the annual temperature anomaly – average of all stations in the NOAA Global Historical Climate Network in the approximate corn growing area in the United States. 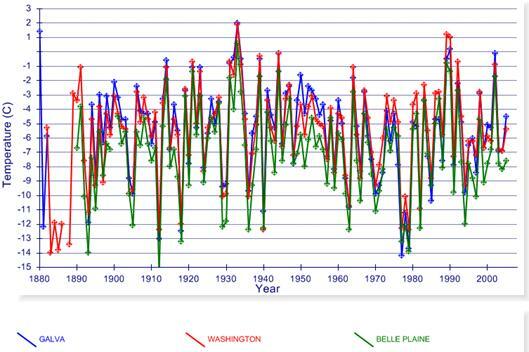 Most of the warming took place in the late 1800s – 1930s, which the IPCC says was due to natural factors. Holland’s opinions on the attribution to ”manmade greenhouse gases“ is in conflict with most other hurricane experts such as William Gray [http://www.businessandmedia.org/articles/2008/20080304113132.aspx] (who is the U.S.’s main hurricane predictor) and Christopher Landsea [http://www.climatechangefacts.info/ClimateChangeDocuments/LandseaResignationLetterFromIPCC.htm] (who resigned from the IPCC due to the organization’s unscientific political process. The following figure shows updated Accumulated Cyclone Energy (ACE) to 2007 for the North Atlantic basin. 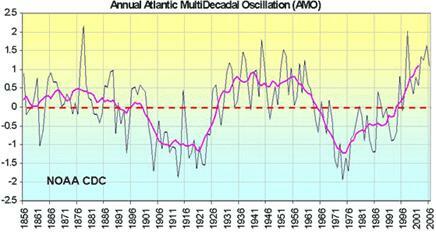 The following figure shows a plot of the Atlantic Multidecadal Oscillation (AMO) [see www.appinsys.com/GlobalWarming/PDO_AMO.htm for details about the AMO], along with the above North Atlantic ACE superimposed on the AMO plot. The correlation is clear. See http://www.appinsys.com/GlobalWarming/GW_Part4_ClimaticEvents.htm for much more details about hurricanes and global warming. Once again Mensa has selected only the alarmist side to hear. Mr. Kunkel has been involved with regional climate modeling studies at the Illinois State Water Survey. 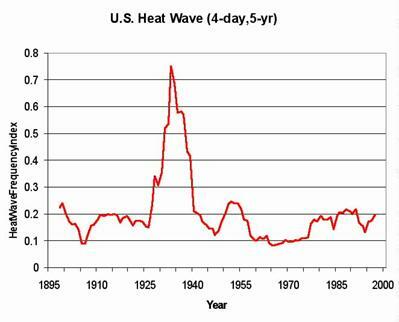 The following figure, also from Kunkel’s work, shows frequency of heat waves (same source as above). Once again the increasing occurrence in the last 50 years belies the no long term change. The following figure shows the annual number of strong tornadoes for the period of 1950 to 2006. 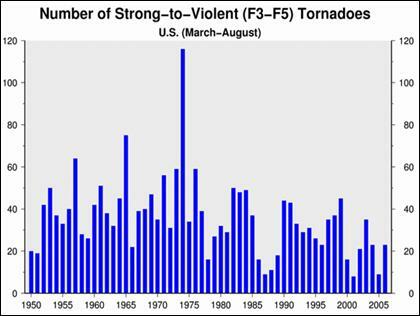 The number of strong tornadoes has been decreasing since the 1960’s. At least Wurman does not appear to be an exaggerator like the other speakers. How intelligent is the science, the politics, and the media's work, relative to the alleged Planetary Changes called "Global Warming"? "Global Warming" - it's a question-begging title - a bit of a set-up, like: "Answer Yes or No: Have you stopped beating your wife?" In this series of three articles we examine this new panic-industry - its evolution, present status, and the opportunities high-IQ folks can pursue in restating the arguments for the planet’s atmospheric health and the role of the society in its future. To ask, How intelligent has society’s role been, is to ask of its historiography, how honest is it? Perhaps not very. We’ve been through these cycles before. Global cooling was the theme in the late 1800s. The New York Times (NYT) reported that geologists thought a new ice age was approaching (February 24, 1895). 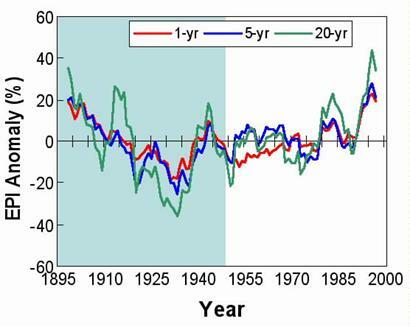 Around 1910 the cooling trend reversed itself – but the global cooling reports continued for another decade. With the warming came more doom and gloom. The NYT reported (March 27, 1933): “America in Longest Warm Spell Since 1776; Temperature Line Records a 25-Year Rise”. Then the cooling trend came back. Time magazine reported (June 24, 1974): “Whatever the cause of the cooling trend, its effects could be extremely serious if not catastrophic” and the NYT (May 21, 1975): “A Major Cooling Widely Considered to Be Inevitable”. [See Ref’s 1&2] Of course, by then the trend was reversing itself once more leading into the recent warming phase (and by now, everyone has heard about the impending doom). The trend appears to be reversing itself once again, with 1998 being the warmest year with slight cooling occurring so far in the 2000s. So, what is different about the recent warming cycle? There are several differences. Computer models are now used to forecast the future. Modern media provides a much greater role in selling fear. A global governing body has asserted a much larger influence on world affairs. In addition, a celebrity - Al Gore - has created a populist fashion for the pseudo-science; and Hollywood has adopted the Myth of the Doomed Planet as a lucrative picture of an elegiac human destiny. Thus, the Human Guilt Story of the Perishing Planet has taken over the definition of science. We think this is unnecessary, unintelligent and will be costly. The IPCC was formed in 1988 with the purpose of assessing “the scientific, technical and socioeconomic information relevant for the understanding of the risk of human-induced climate change.” -- i.e. it is based on the a priori assumption of anthropogenic causation. Although the IPCC has become the “definitive” authority and always makes statements regarding the definite human causation and impending disaster, it has never provided substantial scientific evidence that anthropogenic CO2 is the cause - only that the computer models require CO2 and a positive feedback mechanism in order to simulate recent temperatures since 1970. The “consensus” switched from cooling to warming in just over 10 years, from the mid-1970s to the mid 1980s – but the definition of climate is “average weather over 30 years”. So how did this sudden switch come about, along with its presumption of human-induction? A series of UN-based “environmental” conferences, starting with the 1972 Stockholm Conference on the Human Environment lead the way. Many scientists jumped on the gravy-train as it sped towards monetary enrichment. The United Nations Conference on Environment and Development (UNCED) was held in Rio de Janeiro in 1992 (“The Earth Summit”). It resulted in the creation of the UN Framework Convention on Climate Change (under which the Kyoto Protocol was later developed). The UNFCCC states: “The developed country Parties … shall provide new and additional financial resources to meet the agreed full costs incurred by developing country Parties in complying with their obligations” [Ref.4]. A major change in the definition of climate change also occurred. The IPCC defined climate change as “any change in climate over time whether due to natural variability or as a result of human activity”. But the UN FCCC redefined climate change as “a change of climate which is attributed directly or indirectly to human activity that alters the composition of the global atmosphere and which is in addition to natural climate variability over comparable time periods.” By this new definition, climate change due to changes in natural factors such as oceanic oscillations or solar variability, is not climate change. In 2004 the United Nations University – World Institute for Development Economics Research (UNU-WIDER), published a study of scenarios for implementing a global tax. It states [Ref.5]: “How can we find an extra US$50 billion for development funding? Our focus is on flows of resources from high-income to developing countries… The taxation of environmental externalities is an obvious potential source of revenue. ... Does this mean that the global tax should be levied at the same rate on all countries? To the extent that emissions impose environmental damage wherever they occur, the corrective tax should be the same. However, this needs to be moderated to take account of the unequal distribution of world income. Considerations of global justice point to poor countries bearing less of the cost burden, and may justify the tax being levied only on high-income or middle-income countries. … We are presupposing that the tax is indeed levied on individuals and firms in the form of a carbon levy… Suppose, however, that we have subsidiarity, where the burden on national governments is determined by their carbon emissions, but the national governments are free to decide how to raise the revenue. As noted above, they may for political or other reasons choose another taxbase.” In other words, their real concern is not CO2, but money. Now we appeal to all Mensa members to displace a half-truth with a whole one. The science involved with the global warming issue is of two types: firstly, empirical science – the actual observations, data and their interpretation, and secondly, theoretical science – computer models based on the modeler's interpretation of the phenomena. The two are at odds: that is, there is nothing in the empirical science to support the modelers' doomsday predictions. The temperature trends have a much higher correlation with solar phenomena and with oceanic oscillations than with CO2. [Refs. 1,2&3]. Glaciers have been receding since the early 1800s (before modern CO2) [Ref.4], while the Greenland ice melt was similar in the 1930s [Ref.5] and Antarctica has no warming [Ref.6]. In many regions the current warming is just reaching what it was in the 1930s. But memories are short (perhaps because few people alive today were around then). And the global warming grandstander Al Gore is still selling in Hollywood and -where-youwill an apocalyptic doomsday scenario. So, why has this apocalyptic scare been so widely promoted? The answer is $$Money. (And of course power, since those benefiting the most were already rich). And the big money is in the carbon credit trading. There is an extensive overlap of those who created the scare and those greatly benefiting from it. The carbon credit trading companies are illustrative. At the Chicago Climate Exchange (CCX) is "the world's first … integrated greenhouse gas emissions reduction, registry and trading system", directors include Maurice Strong (creator of UNEP, UNCED, senior advisor to UN Secretaries General Boutros Boutros-Ghali and Kofi Anan and World Bank President James Wolfensohn) as well as Stuart Eizenstat (who was U.S. Ambassador to the EU during the Clinton Administration, Chief Domestic Policy Adviser for President Jimmy Carter, as well as leading the US delegation at the Kyoto Protocol negotiations). [See Ref.7 for more similar examples]. Although the IPCC is promoted as "the consensus", many climate scientists disagree with the specific positions of the IPCC, and the number of dissenting scientists is growing. Canada's National Post has an excellent series of articles documenting some of these scientists [Ref.10]. See also [Ref.11]. Many scientists who disagree with the IPCC bad-news ungospel have found their funding cut off or have been fired (In Europe, Henk Tennekes was dismissed as research director of the Royal Dutch Meteorological Society after questioning the scientific underpinnings of global warming) [Ref.12], but retired scientists are speaking out. A prominent atmospheric scientist at MIT states: "for over 25 years, we have based not only our worst case scenarios but even our best case scenarios on model exaggeration. As far as I can tell, the main question we ought to be confronting is how long the momentum generated by this issue will prevent us from seeing that it has been an illusion based on model error." State climatologists who disagree with the state government belief in global warming have had their titles removed (for example, in Oregon and Delaware) [Ref.12]. To those profiting from the scare, it is a critical emergency – to the rest of the promoters, a ploy for control. Here is a plea to Mensa members to lead the world in clear, critical thinking. We could invite Robert Todd Carroll, creator of the Skeptic's Dictionary [Ref.15], to be our president or Keynoter. The news release would say: "Eggheads cool down Hotheads." The enlightenment and scientific revolution in the 17th and 18th centuries were based on empirical and sensory verification of phenomena and resulted in a freeing of ideas from the shackles of religion. That period was also the end of the little ice age – most of the world’s glaciers have been receding ever since. The dire consequences promoted by the media are contained in statements with the word “may”. For example, although their numbers have greatly increased over the last couple of decades [Ref.4], the polar bears “may” become threatened. None of these scare stories are supported by empirical evidence – perhaps this is the meaning of the word “mayday”. There has been no warming now for the last decade – but it hasn’t slowed the rhetoric – the AGW promoters are getting more desperate and are promoting the feeling of western guilt. At the UNFCCC Bali event (December 2007) NGOs were open about their mission promoting the global warming scare: The Climate Action Network web site provides the following discussion: "A common theme was that the “solutions” to climate change that are being posed by many governments, such as nuclear power, carbon capture and storage (CCS) and biofuels are false and are not rooted in justice. ... a climate change response must have at its heart a redistribution of wealth and resources" [Ref.5]. The development of alternative energy (solar and wind power, etc.) may be a desirable goal, but these should be developed for honest reasons, not as part of a false-science political scam. The future of scientific ideas and their freedom from ideological chains is dependent on learning and spreading the truth. We must not let our scientific future succumb to the autocratic trend that has taken over climate science.